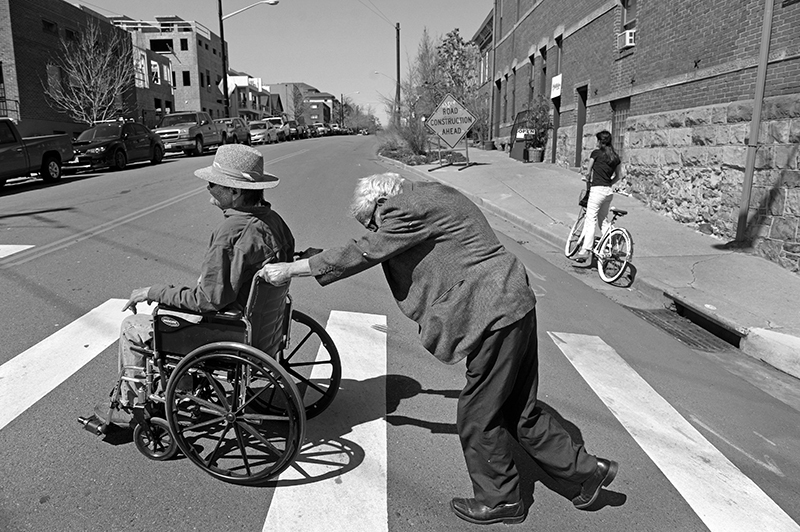 Cecil struggles up a hill with his partner, Carl, after a trip to Little Man Ice Cream in Denver. At 83-years-old Cecil says his commitment can be challenging at times but he knows the outings are important to Carl, "Of course, I think anybody in his position would feel this way... I just can't take him out five or six days a week." While Cecil's role as wheelchair chauffeur is a relatively recent one, he has been the driver for their 44 years together. When they went to visit Shepherd's family in Helena, MT, he was behind the steering wheel of their Pontiac Safari station wagon. Ditto their trips to Birmingham, AL, where Cecil was raised.